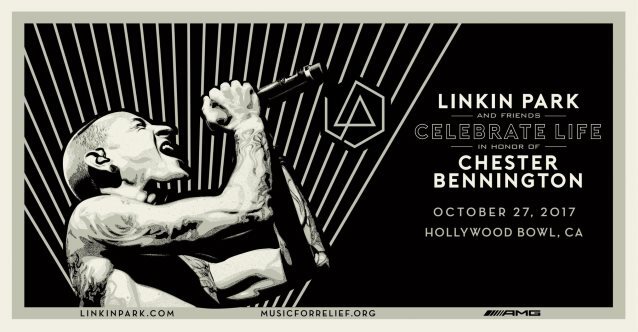 One week from tonight, the surviving members of LINKIN PARK will celebrate the life of their friend and bandmate Chester Bennington with an unforgettable night of music at the Hollywood Bowl in Los Angeles. The one-night-only show sold out immediately, but now fans will have another chance to experience this historic concert event. “Linkin Park & Friends Celebrate Life In Honor of Chester Bennington” will stream live free of charge exclusively on YouTube Friday, October 27 at 7:45 p.m. PT at youtube.com/linkinpark. This historic concert celebration will be the first time LINKIN PARK performs on stage together since Chester passed on July 20. Many amazing artists will be joining them on stage, including BLINK-182, Machine Gun Kelly, Jonathan Davis from KORN, Kiiara, Zedd, members of NO DOUBT, SYSTEM OF A DOWN, YELLOWCARD, AVENGED SEVENFOLD, and many other surprises. As one of the biggest channels on the digital platform, the LINKIN PARK YouTube channel has more than ten million subscribers, and 4.7 billion (yes, billion) views. The band’s latest music video for the song “One More Light” has received more than 33 million views alone. Don’t miss this special once-in-a-lifetime concert to honor a man who touched the lives of so many around the world. Proceeds from the concert will go to Music For Relief‘s One More Light Fund in memory of Bennington. Bennington committed suicide at his home in Palo Verdes Estates, California.